Machen Sie sich auf in die wilde Wüsten- und Berglandschaft des ländlichen Südkaliforniens, die darauf warten, östlich von San Diego entdeckt zu werden. 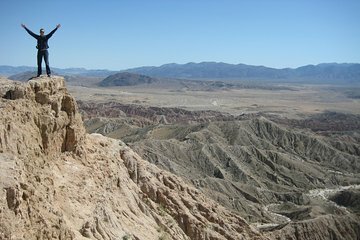 Verlassen Sie bei dieser privaten Ganztagstour die Stadt und die Strände hinter sich, während Sie durch Slot Canyon wandern, durch die Pfade des Cleveland National Forest und des Anza Borrego State Park schlendern und vom Aussichtspunkt Font's Point aus auf die Badlands blicken. Erleben Sie auch die ländliche Kultur mit Stopps zum Mittagessen und Einkaufen in der historischen Bergbaustadt Julian und einem erfrischenden Getränk am Ram's Hill Gold Course. Had a wonderful trip! I was travelling alone and it was not possible for me to visit Anza Borrego by myself. Morty was very friendly, and knowledgeable about the area.We manage to cover a lot Julian, Font's Point, Slot Canyon, Borrego Springs and Anza Borrego State Park in 6-7 hours. Highly recommend this trip with Coastal tours of San Diego ! had a wonderful trip. Though the weather was not too good ,very cold and windy ,my tour guide Morty made sure I had a great time. He was flexible about timings, places to see and took me to some really awesome hikes and sights. Highly recommend this trip with Coastal tours of san Diego !! Our group was picked up on time at our hotel by Marty. He was engaging and insightful the whole way to Anza Borrego - the stop for apple pie in the pretty former mining town of Julian was most welcome. The desert park itself is a beautiful landscape, although the little town of Borrego Springs is close by so you don't feel that you are far away from civilization. Marty took us through the winding Slot Canyon - some tricky gaps to negotiate but not challenging for anyone with a basic level of fitness. From the canyon to Borrego Springs for lunch and then on to Font's Point. This is a spectacular viewing location where the landscape opens out looking east to the many mountains and the Salton Sea some 40-odd miles away. Traveling here in November meant that heat wasn't an issue, it was pleasantly warm but this trip would be a little harsher in the Californian summer. The variety of landscape, the stunning silence from Font's Point and most of all a brilliant tour guide came together to make this the highlight of our visit to the San Diego area. I cannot recommend this tour highly enough!